Batman - and Michael Keaton - return to the screen in the record-breaking and gripping epic adventure that pits the Dark Knight of Gotham City against an array of diabolical villains - the vicious Penguin (Danny DeVito) with his umbrellaful of evil tricks, the sensuous and mysterious feline temptress, catwoman (Michelle Pfeiffer) and the scheming mega-millionaire Max Shreck (Christopher Walken). 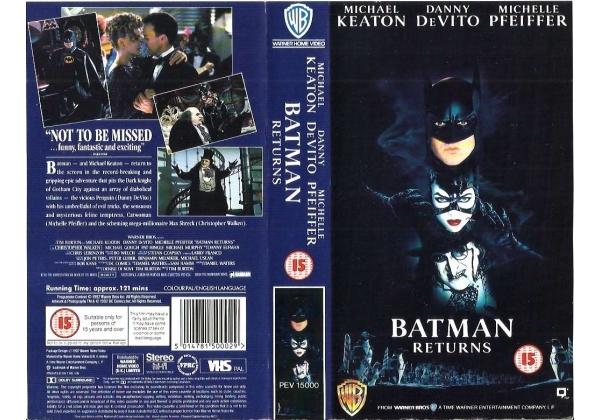 Batman Returns (rental) was released in 1992 by Warner Home Video to coincide with the (retail) release of Batman Returns on VHS. This is the much rarer release. Both releases are small box, and the (rental) release has a navy blue sleeve spine. The (retail) release of Batman Returns has a black sleeve spine. The Cat no. for Batman Returns (retail) PES 15000. Or find "Batman Returns" on VHS and DVD / BluRay at Amazon.